Michael Eugene Moore was featured on "America's Most Wanted" after he was accused of stabbing his wife 33 times and abducting their 5-year-old daughter in March 1996. 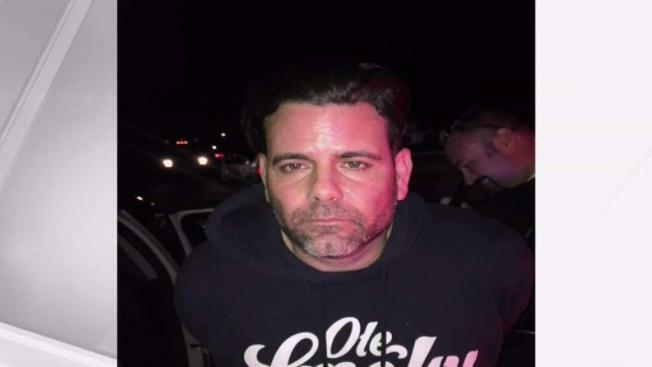 A Virginia fugitive who was featured on "America's Most Wanted" two decades ago was arrested after a three-hour standoff with deputies in Florida, authorities said. The Flagler County Sheriff's Office said 46-year-old Michael Eugene Moore has a fugitive warrant in Virginia. Moore was featured on "America's Most Wanted" after he was accused of stabbing his wife 33 times and abducting their 5-year-old daughter in March 1996. His wife survived. Weeks later, their daughter was found in Miami and returned to her mother in Richmond, Virginia, after the little girl's photo appeared on the show. Moore remained a fugitive until Saturday. That afternoon, a license plate reader in Florida detected a vehicle that had been stolen during an armed robbery in Virginia, according to the Flagler County Sheriff's Office. Deputies signaled the driver to stop in Palm Coast, south of Jacksonville. Moore eventually stopped but refused to get out, so the sheriff's office established a permieter and begain to evacaute homes in the immediate area, authorities said. Moore surrendered three hours later after the sheriff called in a SWAT team. Moore is being held in Florida, where police say he is facing charges of grand theft and resisting arrest without violence in Flagler County. He is also being held as a fugitive from justice for Virginia authorities, the sheriff's office said.